A selection of links to educational websites compatible with the Big Cycle scenario. "I have a hunch that the universe is built like an enormous feedback loop, a loop in which we contribute to the ongoing creation of not just the present and the future but the past as well". John Archibald Wheeler, theoretical physicist. John Archibald Wheeler on the participatory universe Eminent theoretical physicist. An excellent account on the notion that we are shapers and creators living in a participatory universe. Interview by Tim Folger. David Bohm on the implicate order Eminent theoretical physicist. The notion of wholeness as the origin of the universe from which physical reality unfolds, at lower energy levels. AIAS: The unified field theories of Myron Evans Exciting developments, with great potentials for new applications in medicine and free (over unity) energy devices. Detection of subtle matter through weight measurements, by Dr. Klaus Volkamer. A discovery with great potentials for new applications in medicine and free (over unity) energy devices. Website is mostly in German. Life is inevitable in our creative universe. Interview with Stuart Kauffman, widely acclaimed for his research on self organization in biology. From the Paula Gordon Show. Self organization: patterns and function In biological systems. The Gaia theory - Science of the living earth An introduction to the Gaia Theory developed by James Lovelock. The holographic universe A good general overview on Crystallinks. David Bohm's holographic universe An introduction to David Bohm's views on the holographic nature of the universe. Karl Pribram: on the mind-brain relationship Karl Pibram, former professor of neuropsychology at Stanford University, interviewed by Jeffrey Mishlove, on the holographic nature of the brain. The self-aware universe Views by Amit Goswami, Theoretical Quantum Physicist, on consciousness as the driving force in the universe. Institute of Noetic Sciences Homepage of the institute with many links on consciousness research. The roots of consciousness: The reflexive universe The views of Arthur M. Young. Interview by Jeffrey Mishlove. Consciousness and the new physics A compilation of different viewpoints from leading thinkers. By Jeffrey Mishlove. Arthur M. Young on Science, Spirit and the Soul The nature of intent, motivation, spiritual origin of consciousness and the enfolding nature in the physical universe. Physics and consciousness Interview with Fred Alan Wolf in the Thinking Allowed TV series. Thinking Allowed Many links to organizations, interviews and speakers on subjects related to consciousness as the driving force in the universe. Primordial Energy - The legacy of Bruce DePalma A pioneer in prototyping a working 'free energy' generator. Potential vortex, scalar waves & alternative energy By Konstantin Meyl. Highly interesting. With over unity energy demo and scalar waves faster than the speed of light. Free Energy - The N-Machine An excellent overview on the early developments of 'free energy' devices and the underlying principles. By Richard Walters. The Institute for New Energy A hosting web site with many links to web sites on new energy sources. The Tom Bearden Website Exciting developments in the development of commercially viable 'free energy' generators. Underlying theories have wide ranging implications and applications. Dr Thomas Valone of Integrity Research Institute on Zero Point Energy, ZPE, with many interesting links. Stuart Hameroff's Home Page Author of the Quantum Mind; Consciousness, Quantum Physics and the Brain. Introducing the concept of non-local connections of the brain through the discovery of microtubules. The translation in every day language is this: The brain is connected to the non-physical domain at the functional level. Hence, a path for thoughts and emotions to migrate across the boundaries of the physical and non-physical. Fanthom DNA, an effect discovered by Russian scientists Peter Gariaev and Vladimir Poponin demonstrating influences of subtle energy, coherent light, feelings and the spoken word on DNA. Great potentials for new, non pharma based, healing methods. "The so-called empty space in the universe contains an immense background of energy. Matter, as we know it, is just a small quantized wave-like excitation on top of this background, rather like a tiny ripple on a vast sea". author of Wholeness and the Implicate Order. 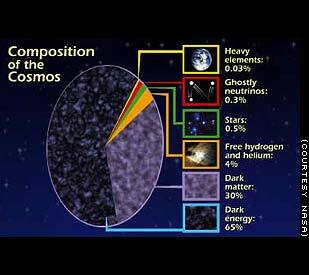 Dark matter and dark energy make up 95% of the universe. For a NASA review of technologies for future space engines based on dark matter or zero point energy -ZPE- see this link. Are we rediscovering the aether, but now it is called dark matter or ZPE? I think that all the contradictions about whether the aether exists or not are the result of a wrong interpretation of aether's properties. The aether has always been presented as an aeroform environment [gaseous]. That was the essential mistake. The aether has a very strong density. It is known that with greater density of a substance, the higher is the speed of wave propagation within it. When comparing acoustic speed in the air and the light speed I have drawn a conclusion that aether density is several thousand times higher than air density. It is not the aether that is aeroform [gaseous] but the material world is an aeroform to the aether!" Science is not about dogma, but about evidence. When quantum physics is interpreted in the context of the Big Bang scenario it tends to disconnect with contemporary developments in humanistic psychology. However, when quantum physics is interpreted in the context of the Big Cycle scenario derived from the LOTA philosophy of science, it reconnects. The following links to research sites and organizations give some examples. Extrasensory perception (ESP) A good overview on academic research. The Roots of Consciousness Many links to Psi research. Parapsychology and Psi research with many links. Intuition Network Psi research links, articles and interviews. Metaphysical and science website By Ellie Crystal. A big site with many links and articles on a wide range of subjects. Out of Body Experience Research Foundation Experience sharing via the web. International Association for Near Death Studies A website with good information, resources, support and many links. Near Death Experience Research Foundation A site for experience sharing. The Institute for Afterlife Research A big website with good information on a wide range of related aspects. Life After Life - Raymond A. Moody Homepage of a pioneer. Reincarnation Research Ken Williams' research conclusions, with many links. All the above links are selected in order to enrich the Big Cycle scenario debate. There is no content endorsement on our part of these sites and there is no implied content endorsement on their part regarding the content of our site.